There's little on the exterior of this 1965 Mustang to indicate it is actually one of three fitted with a Harry Ferguson Research 4 wheel drive system. Amazingly, this interesting prototype has survived the past 46 years in very nice original condition. This unique Mustang is currently for sale in Britain, not far from where Harry Ferguson originally modified it. If Ferguson and 4x4 ring a bell it is likely because in 1960 their P99 Ferguson Formula One car won at Oulton Park while being driven by a young Stirling Moss. It still remains the only four wheel drive victory by a Formula One car today. Later the company's "Ferguson Formula" four wheel drive would be adopted by Jensen for use in the Luxury FF. In between these two events, Harry Ferguson Research LTD. purchased 3 Mustang notchbacks and converted them to 4x4 in an attempt to sell potential clients on their FF system. Although the company was based out of Britain, it is interesting to note this car is Left Hand Drive. This Mustang has only traveled a very well documented 72,870 miles. 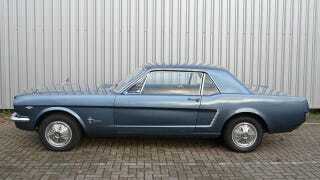 After it's life as a promotional tool was done the Mustang remained in the Ferguson family until 2007. At that point the car changed hands for the very first time in its life. Consequently the car is being advertised for sale as a two owner car. This Mustang might not be perfect but it is very unique—no small feat for a notchback 1965 Mustang. If you want to feel the four wheel drive difference in a vintage Mustang, this is your chance but be forewarned—the novelty isn't cheap. The car is currently being advertised for £45,000 or $70,505.